表四 In vitro activity of six antimicrobial agents against 2010 H. pylori strains isolated from 1998-2007 at National Cheng Kung University Hospital. 註： The resistance breakpoints for amoxicillin, clarithromycin, metronidazole, tetracycline, and fluoroquinolones were defined as ≥ 0.5, ≥ 1.0, ≥ 8, ≥ 4, and> 1.0 μg/mL, respectively. Minimal inhibitory concentrations of amoxicillin, clarithromycin, and metronidazole in H. pylori isolated from 1998–2000 were published previously and were not included in this study. 註： Cip, ciprofloxacin; Lev, levofloxacin; Gar, garenoxacin; Gat, gatifloxacin; Mox, moxifloxacin; Tro, trovafloxacin. 1. Pounder RE, Ng D: The prevalence of Helicobacter pylori infection in different countries. Aliment Pharmacol Ther 1995; 9: 33-9. 2. Vakil N, Megraud F：Eradication therapy for Helicobacter pylori. Gastroenterology. 2007; 133(3): 985-1001. 3. Lin JT, Wang JT, Wang TH, et al: Helicobacter pylori infection in a randomly selected population healthy volunteers, and patients with gastric ulcer and gastric adenocarcinoma：A seroprevalence study in Taiwan . Scand J Gastroenterol 1993; 28: 1067-72. 4. Parsonnet J, Hansen S, Rondriguez L, et al:Helicobacter pylori infection and gastric lymphoma. N Engl J Med 1994; 330; 1267-71. 5. Vakil N: Primary and secondary treatment for Helicobacter pylori in the United States.Rev Gastroenterol Disord. 2005 Spring; 5(2): 67-72. 6. Hojo M, Miwa H,Nagahara A, et al: Pooled analysis on the efficacy of the second-line treatment regimens for Helicobacter pylori infection. Scand J Gastroenterol 2001 Jul; 36(7): 690-700. 7. Graham D, Low G, Malaty HM, et al: Factors influencing the eradication of Helicobacter Pylori with triple therapy. Gastroenterology 1992; 102; 493-6. 8. Fuccio L, Minardi ME, Zagari RM, et al: Meta-analysis: duration of first-line proton-pump inhibitor based triple therapy for Helicobacter pylori eradication. Ann Intern Med. 2007; 147(8): 553-562. 9. Malfertheiner P, Megraud F, O&apos;Morain C, et al: Current concepts in the management of Helicobacter pylori infection: the Maastricht III Consensus Report. Gut 2007; 56: 772-81. 10. 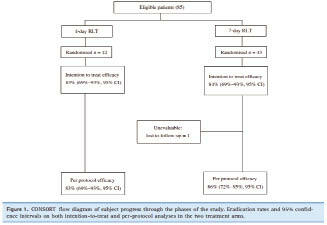 E. G. Glannini, C. Bilardi, P. Dulbecco, et al: A study of 4- and 7-day triple therapy with rabeprazole, high-dose levofloxacin and tinidazole rescue treatment for Helicobacter pylori eradication. Aliment Pharmacol Ther 2006; 23: 281-287. 11. Nimish Vakil, Dino Vaira.Sequential Therapy for Helicobacter pylori: Time to Consider Making the Switch? JAMA. 2008; 300(11): 1346-1347. 12. Miehlke S, Madisch A, Bästlein E, et al: One-week triple therapy with esomeprazole, levofloxacin and amoxicillin is effective for eradication of Helicobacter pylori sensitive to metronidazole and/for clarithromycin. Helicobacter 2003; 8: 464. 13. Wong WM, Gu Q, Lam SK, et al: Randomized controlled study of rabeprazole, levofloxacin and rifabutin triple therapy vs quadruple therapy as second-line treatment for Helicobacter pylori infection. Aliment Pharmacol Ther 2003; 17: 553-560. 14. Hung KH, Sheu BS, Chang WL, et al: Prevalence of primary fluoroquinolone resistance among clinical isolates of Helicobacter pylori at a University Hospital in Southern Taiwan. Helicobacter 2009 Feb; 14(1): 61-65. Helicobacter pylori (Hp) has been confirmed that could cause gastritis, stomach and duodenal ulcer, and is listed as the first class of stomach&apos;s carcinogen (WHO 1994). Proton pump inhibitor (PPI) is the basic element to which combines two kinds of antibiotics then become as the so called triple therapy. And this way for eradicating the pathogens now is used wildly. However there still are about 15-20% patients who have failed in treatment by this Gold Rule. In recently, the ratio of treatment failure increases fast. The patients&apos; compliance and pathogens resistance are considered the major reasons to make this condition. Based on the EBM (Evidence-Based-Medicines), the purpose of this study is to discuss the clinical benefit compared with using of levofloxacin to that of the traditional triple therapy (amoxicillin+clarithromycin+PPI).